SILConverters 2.1 is a major update of the previously released Encoding Converters (EncCnvtrs) package. Among other improvements, this packages is fully integrated with SIL FieldWorks, providing a single system-wide registry of installed and available encoding converters. Additionally the new package includes some extra utilities such as a clipboard converter for manipulating text between cut and paste operations. This package provides a system-wide repository for encoding converters and transliterators (TECkit, CC, or ICU based) and a simple COM interface to select and use a converter from the repository. It is easy to use from VBA, C++, C#, or any .Net/COM enabled language. An included VBA macro provides a simple interface to manage and use the repository, making it easy to convert any file (e.g. SFM texts, lexicons, and even Word documents) to a different encoding based on one or more TECkit maps and/or CC tables. The macro interface also provides the ability to install and remove user-developed converters to the repository. The system consists of separately downloadable components. The primary (and required) component contains the main setup files and programs. The optional components contain collections of converters that may be of interest. In the future, new converters will be made available by packaging them as additional optional components. When you run one of the downloaded components, it unpacks itself into a shared installer folder (SILConverters21) and then launches the setup program. The setup program then lets you configure exactly what programs and converters you want to be available on your system. Do not delete the shared installer folder (SILConverters21). You may, now or in the future, want to download additional converter modules, and they use this shared installer folder and setup program as well. This package requires the Microsoft .NET Framework Version 1.1 Redistributable. This is a large download (22M!) but it is supplied with a number of products so you may already have it. If you are unsure whether or not you have it, you can look at Control Panel / Add or Remove Programs. Alternatively, simply try the next step of the install — it will fail if .Net isn't available. unchecked: the item is not installed or will be uninstalled. grey: the item is installed. checked: the item will be installed. Many of the items have "tips" — if your cursor waits over an item a popup tip will tell you more about it. The Word Document Templates list includes all templates you have installed on your system, not just those that came with the SIL Converters package. (In the above example you see Hallissy Highlights A4.) While you can use this dialog to uninstall any templates you have, I do not recommend it unless you have a backup somewhere. The templates supplied with the package are Data Conversion Macro and SpellFixer. Templates Templates installed here are not automatically available but can be made available using Word's Tools / Templates and Add-Ins... dialog. Startup Assuming Word's Tools / Macros / Security... / Security Level is set to Medium, templates installed here will be available automatically every time you start Word. 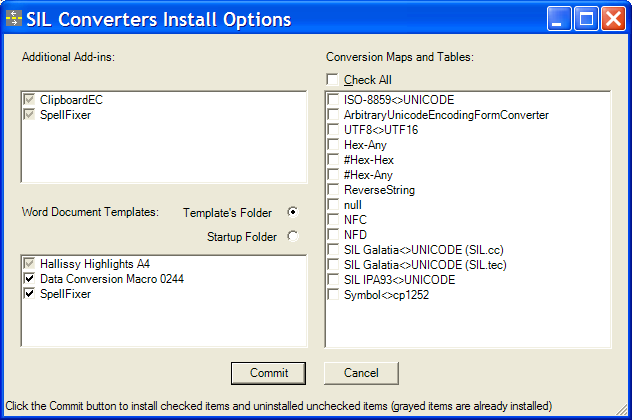 Review all the components in the installer dialog. Components that you want added to the installation should be checked, components that you want removed from the installation should be unchecked. When ready, click Commit . When that is done, click Cancel . If you are installing Word Document Templates, you will get warning that the templates have been installed only for the current user. Any other users who also want access to the templates will need to run SetupSC.exe. As noted, you can download separate packages that add additional components such as converter modules for specific encodings. To use these, simply download and run the desired package. This will load the new items into the shared install directory (you didn't delete it did you1?) and automatically launch the installer. At any time you can reconfigure what modules are installed and available by running the SetupSC.exe program from the shared install folder created in Step 3. For further information about using the Word macros: using Windows Explorer, locate a copy of the Data Conversion macro template. Assuming you still have the shared install directory around (from Step 3 of the Installation instructions), you can look in there for a copy. Right-click on the .DOT file and select Open from the context menu. The template file has documentation in it. The CC, TECkit, and ICU run-time conversion engines. null: do nothing converter that is useful for globally changing data in one font to another with the Data Conversion Macro in Word. NFC: normalize fully composed form of a Unicode string. NFD: normalize fully decomposed form of a Unicode string. Note that these transliterators can be daisy-chained together to transliterate between non-Latin scripts. For example, chaining the 'Devanagari-Latin' transliterator (in the Forward direction) with the 'Tamil-Latin' transliterator (in the Reverse direction) gives a 'Devanagari-Tamil' transliterator). 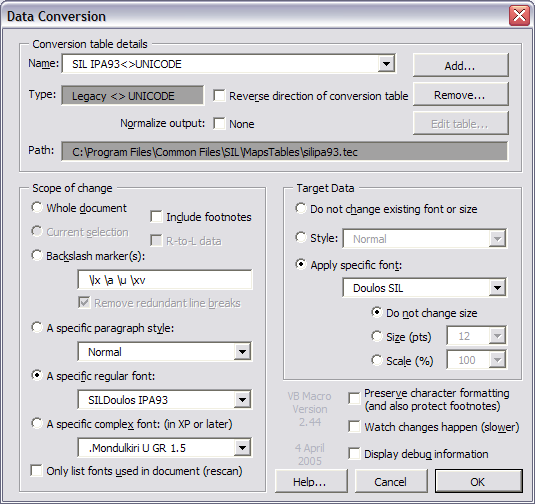 Use the Data Conversion Macro, Add button to daisy-chain converters/transliterators together. By the end of this tutorial you should be able to convert (roundtrip) structured data and test it by bringing it into various applications. Any issues discovered in this process should be fixed in the mapping files. 1 If you did delete the shared install directory that was created during Step 3, simply re-create it by repeating that step. When the installer dialog appears, press Cancel and try Step 4 again.